As I walked across the campus past classroom after classroom of engaged students, I felt the reverence, too. Everywhere I looked, I saw kids fully involved in a variety of activities, some with intently focused teachers, and others with fellow students. The setting was serene, but with a palpable sense of mission: dedication, love, and hard work. It felt like a sacred space. I’ve never felt a greater sense gratitude for the work of all the scientists, advocates, visionaries and builders working to provide the healthiest possible environment for our children. The project is going to be completed early next year and celebrated at Gulf Coast Green 2014, whose theme is Teaching Buildings - Best In Class Green. It’s the green building event I’m most looking forward to. With gratitude for sharing this inspiring experience with me, congratulations to the Monarch School and the Monarch project team: Architend architects, GreenNexus consulting and Tend Building. 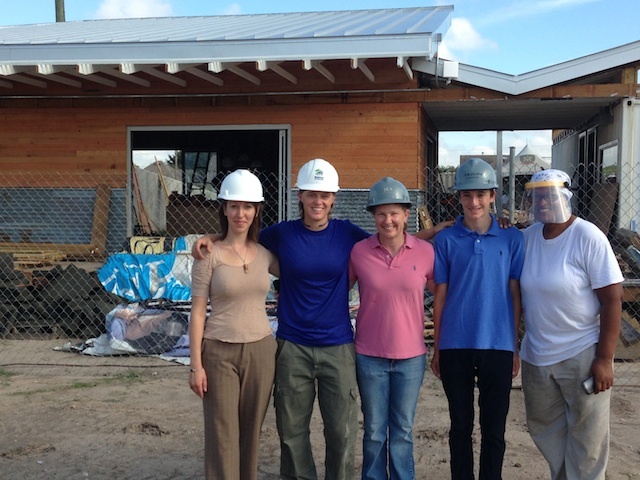 Photo: Jamie Lawson, Shannon Bryant, Shelly Pottorf, and C. Jules with student intern at the Monarch School Living Building site.